Another plan is ripe with sailors United States. Now it concerns the development of a special binoculars, which will allow to recognize personality person from a distance of up to two hundred meters. Such an optical device can be created on the basis of the project with the California company StereoVision Img. The project concerns the creation of ad hoc wireless 3D positioning system of human persons. With all this sense the project is not even to get a relatively accurate picture of persons, but rather to identify the person using the remote scanning of the retina of his eye. The trial period is defined in 15 months, and during this time the miraclebinoculars, According to experts the Navy is required to obtain the final version of the design. After binoculars "See" the image of the retina of the eye or the other person, it will give a picture on a wireless network to identify the target. Apart from the scanning system binoculars can be use and how ordinary optical device that simply need a military navigator. Representatives of the U.S. Navy's report that new binoculars do not plan to use as an optical sight for a certain type of weapon. 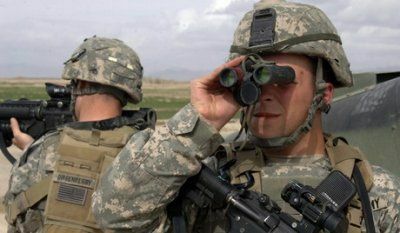 Although if you do not plan, it is not entirely clear why the military are called objects within the field of view of binoculars only goal. Let us leave this fact to the conscience of the American sailors. Now the development of remote determination of human retina already at the disposal of StereoVision Img. Special sensors can detect a person at a certain distance, and can be applied, for example, to control crossing at the entrance to the hidden object mode without omissions or special cards. Such a system, which bears the title 3DMobileID, which recognizes the retina of the human eye at a distance of no more than 100 meters to the U.S. military that distance seemed missing, and they put the company puzzle — double it. If such a system is implemented, it may be that it will be able to enjoy far not only military sailors. Specialists say that the option of remote determination of a person's personality can also be used to access specific databases, storage info, etc. Already, biometric scanners are used Yankees in Afghanistan. But while the work of scanners is the fact, that man to identify the person came very close to the scanner. If both new versions of remote scanners, it will allow to increase safety on the streets of Afghanistan (and not only the Afghan) cities.